The appearance of the first teeth can be a miserable time for both babies and their parents. The emergence of first teeth usually starts at 3 or 4 months old babies and continues until 3 years of age. Babies often feel moody and cranky, and usually grab everything around them and chew it. Teething may even lead to food rejection or refusal of breast milk, and the stress may affect the immune system and cause infections. Kids might suffer from runny nose, fever, rash or diarrhea, due to the teething. Homeopathic remedies are recommended even for babies, because they don’t have any side effects and won’t harm the child. Aconitum apellus – is used in painful teething which makes a child scared and nervous. The gums are usually inflamed, and a child often experiences redness of the face. The sleep of these children is usually disturbed by teething. Belladonna – is the remedy for gum inflammation and pain. Little patients often have flushed face, and high temperature, and sometimes may wake up crying during the night. Calcarea carbonica – slow teething might be helped with this homeopathic remedy. Kids who require calcarea carbonica are usually overweight, slow to walk and sweat during their sleep. Calcarea phosphorica – is also helpful for kids whose teeth grow slowly. Those children are easily irritated, have stomach problems and may be having food allergies and bad teeth. Chamomilla – extreme pain and irritation caused by teething is often solved with chamomilla. Green diarrhea and the need to chew something cold also indicate the use of this remedy. Coffea cruda – is proven helpful when the child can’t sleep because of the condition. Sometimes, these kids feel better if they have something cold pressed onto the gums. Ignatia – twitching in the sleep, being upset and sad because of the teething are treated with ignatia. Kreosotum – saliva irritates the children needing this remedy. Also, these kids may have really bad teeth that decay soon after they come out. Magnesia phosphorica – warmth and pressure applied to the gums usually help these kids to relieve the teething pain. Phytolaca – when babies reach anything that surrounds him/her and press that thing to the gums, the right remedy is phytolaca. Pulsatilla – help babies that need to be carried all day. These kids cry often. Chewing on something cold helps and warm usually worsen the symptoms. 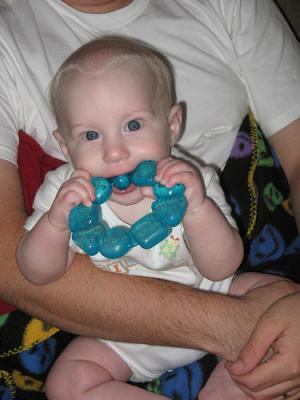 Silica – helps when the process of teething is really slow. Kids that need to be treated with silica are sensitive to cold and are often ill, with fine hair. Suplhur – is indicated when the child suffers from diarrhea and rash on the chin or bottom. The heat often worsens the teething problems in these children.